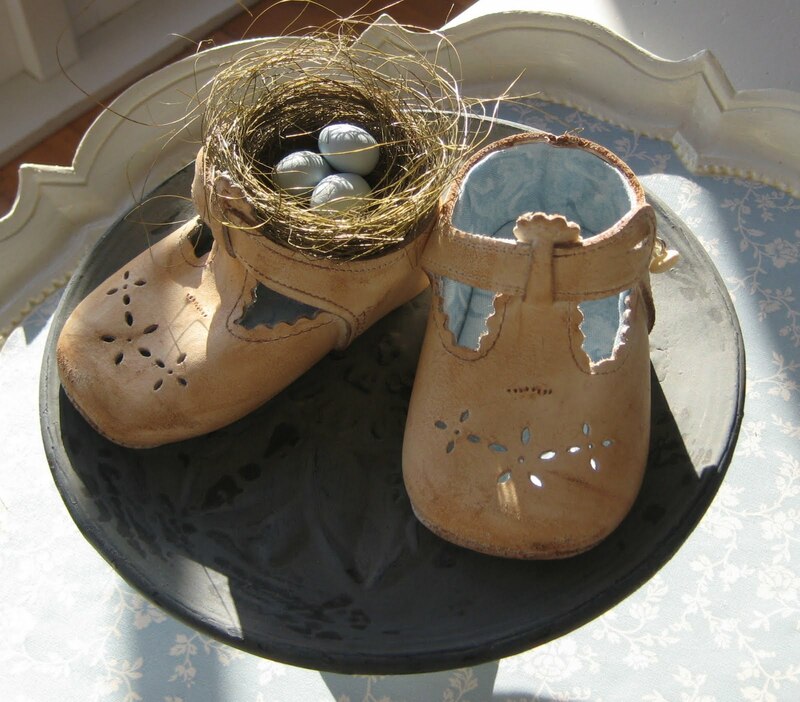 Birds nests and baby shoes - small and smaller! A few weeks ago Sylvia showed me a picture of some vintage baby shoes with a little birds nest in them that she had made. Click here to see Sylvia's baby shoes. I knew immediately that I had to make them too. 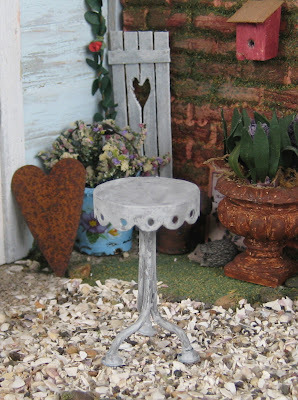 Sylvia told me she had found the idea at this wonderful blog - Treasures from the Heart (click to visit). Barbara Jean at Treasures from the Heart has a tutorial showing you how to make a pair of new baby shoes look vintage. Click here for the tutorial. 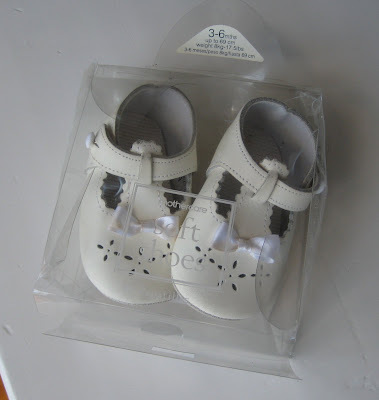 After going to at least 6 Op shops and not finding a single baby shoe I decided to use these brand new ones that my mum bought in England before Noah was born (we didn't know if he was going to be a boy or a girl). For some reason I never used them for Liberty. So technically they are 13 years 'old'! I didn't quite follow the tutorial, I just wiped some antiquing medium in 'Down Home Brown' all over the shoes - very quick (I always try and find a fast way of doing things)! And then I spent a bit of time lining them with fabric to match the eggs. 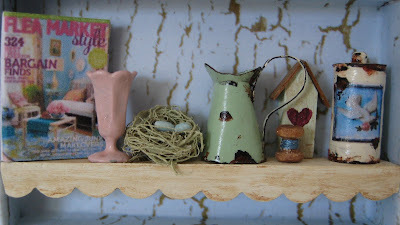 The eggs I made from modelling clay on the advice of Barbara Jean. The nest I made from some 'stuff' (can't remember what it was called) I found in the bargain bin at the flower supply shop. I'm very pleased with the result! 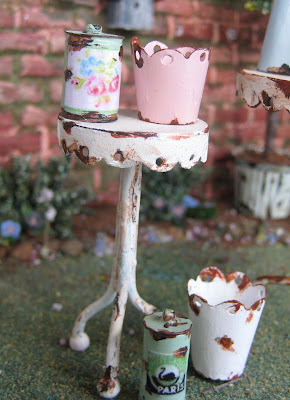 And just because everything needs to be made in miniature (doesn't it Lize!) 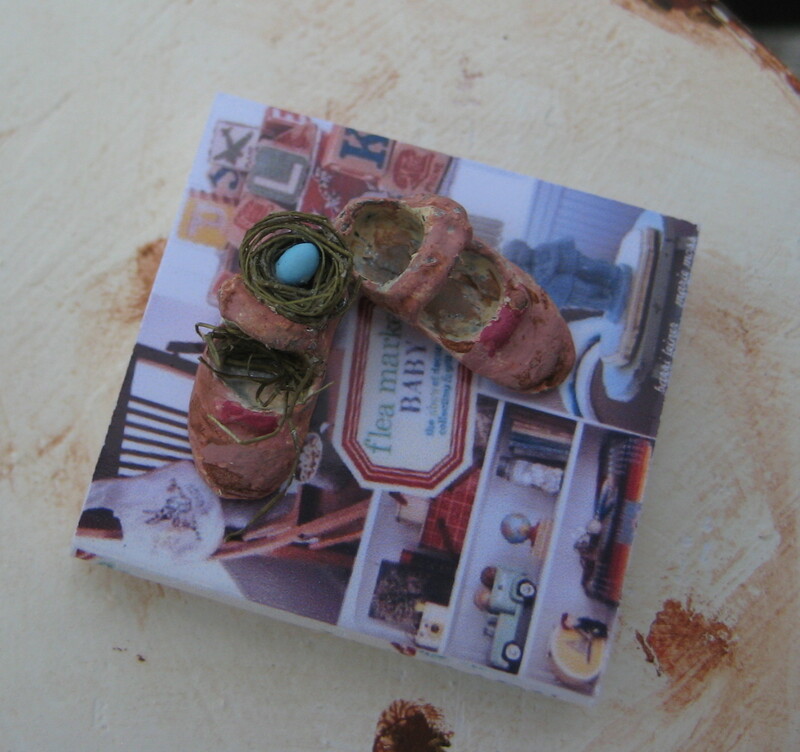 I made some 1:12 vintage baby shoes complete with nests. 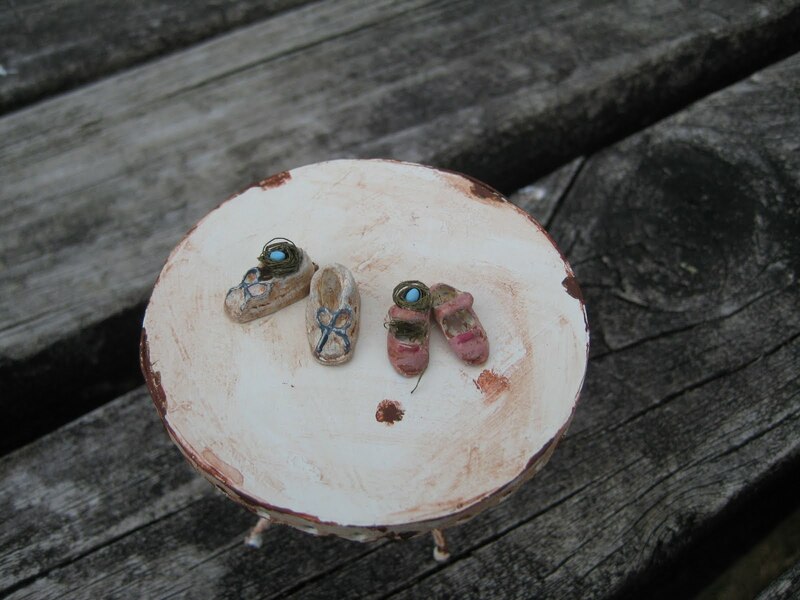 The shoes are about 1cm long and are metal minis - I have a lot of fun with metal minis! 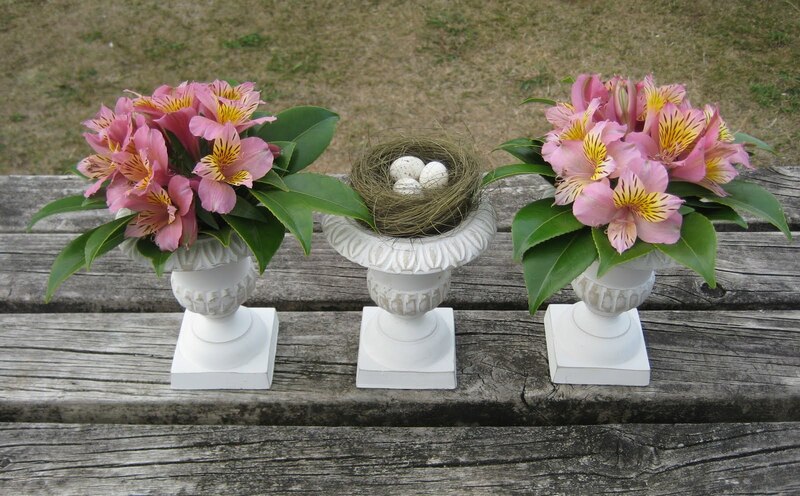 The mini nests are made of the same stuff as the larger ones. 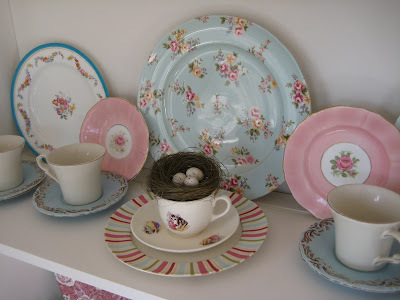 Now there are nests appearing all around the house! How cute is that! 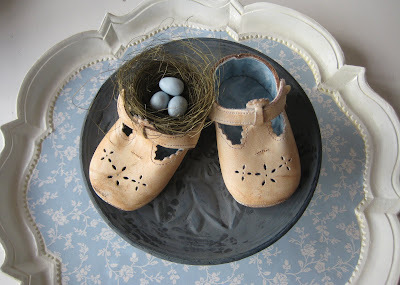 I may not have found baby shoes at the Op shop but I did happen to find those three plastic eggs in a perfect size! The kitty cup and saucer were given to me by a friend because the saucer has a chip in it. The stripey plate and the blue floral one are part of a setting I bought for Liberty for her 5th birthday because the design is called 'Liberty'. 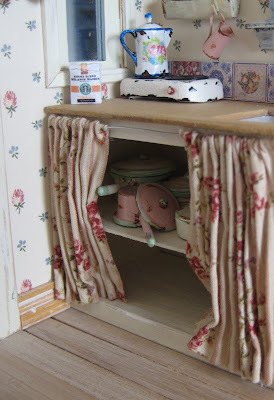 I found those pink plates at the Op shop the other day, I was going to put them in the playhouse but they kind of look like they belong right there! 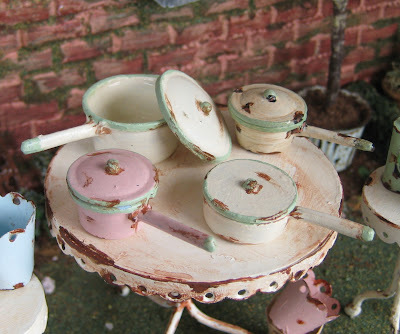 I needed some vintage saucepans for the shabby house and after searching the world for them and seeing how much they cost I decided I should have a go at painting some myself. 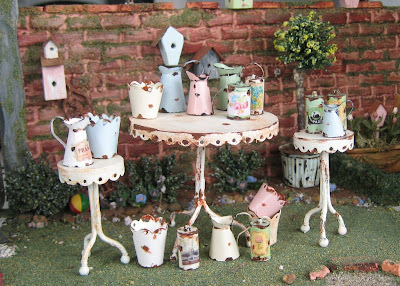 I had a rummage around and was surprised to find I had so many pots. 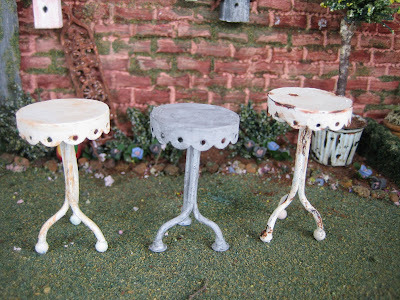 These were all originally painted speckled dark blue. 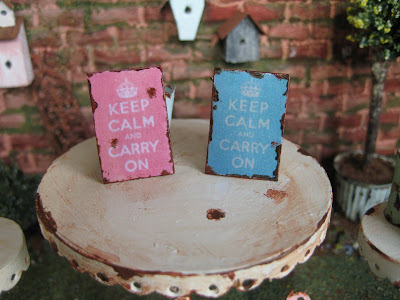 Here they are in the shabby kitchen cupboard. I guess I should start thinking about some food to go on the other shelf. 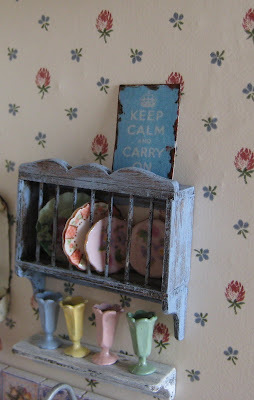 I also painted those metal mini kitchen utensils and I made another rack like the one Sylvia made me because it needed to be a bit smaller once I had hung the plate rack up. 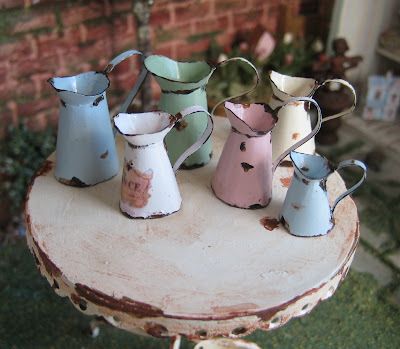 And that little pink jug is the tiniest one I've made so far. 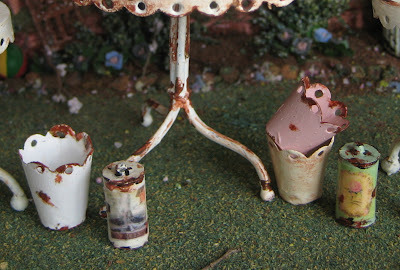 As you can see I haven't got tired of making rusty things yet! A while ago Liberty recieved this most gorgeous peg doll from the wonderfully clever Jo (click her name to go to her blog) at Salt and Pepper. 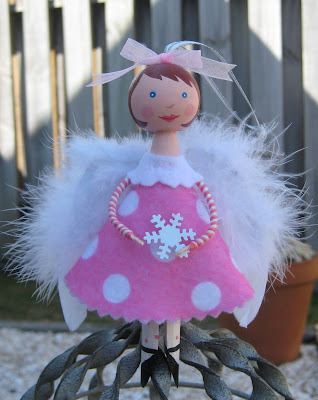 Or click here to go to Jo's Etsy store where she is now selling these little beauties in the most gorgeous spring outfits. 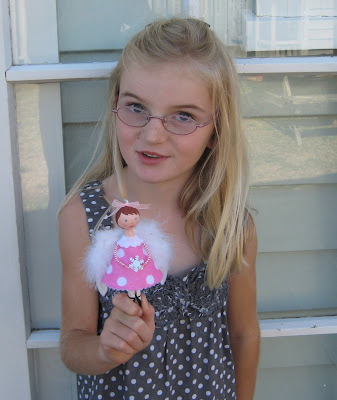 Jo paints these dolls to perfection! 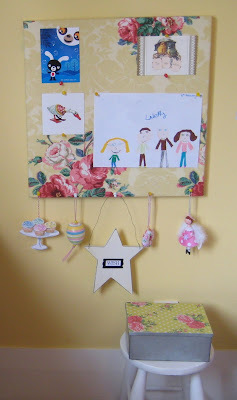 Liberty has named the doll 'Jilly' and when she's not being played with she lives on the notice board I made for her room. 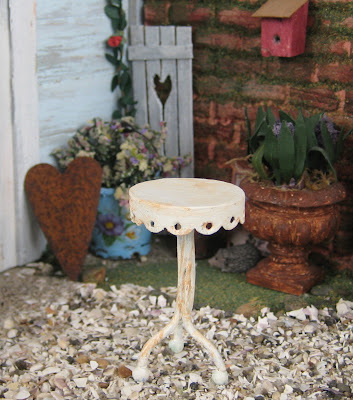 The board is covered with another fabric sample and Sylvia sent Liberty that tin on the stool that just matches everything perfectly! And this gift from Jo left me speechless! 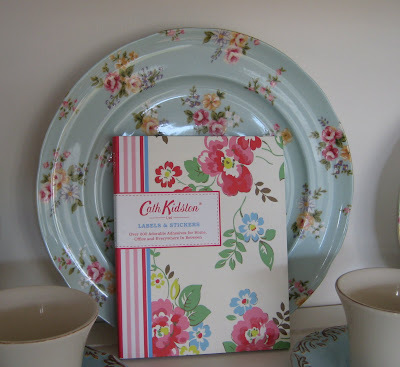 The Cath Kidston Labels and Stickers book - never did I think I would ever actually own a real Cath Kidston book! Let me tell you the labels and stickers in it are fantastic! 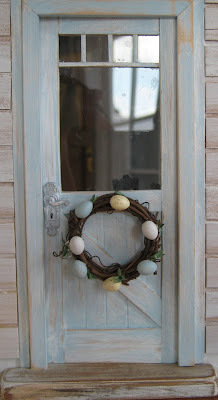 Jo also made me this fabulous mini Easter wreath which I just love! 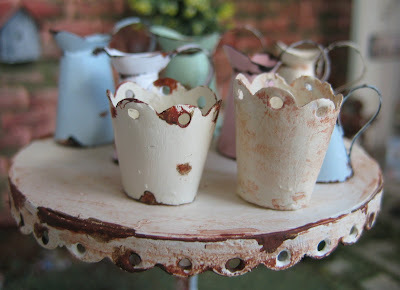 It's perfect on the shabby house and the country house. Still having fun with rust! Oh! How I wish I could come across a market like that in real life! Hope you've all had a fun weekend! 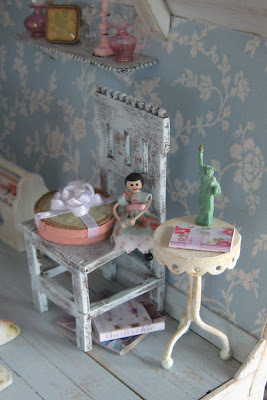 My wonderful friend Sabiha sent me this gorgeous little 1:12 scale dress. 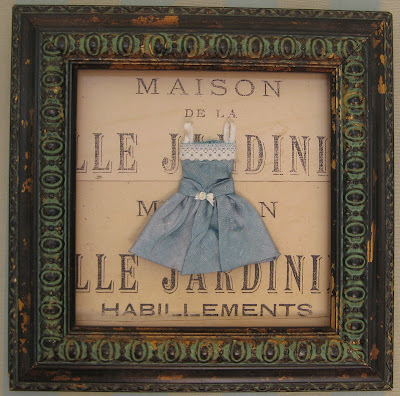 She made it from silk that came from one of her husband's old ties (now that's recycling at its best!) and it is the most beautiful shade of blue. The dress is so spectacular that I wanted to do something very special with it. 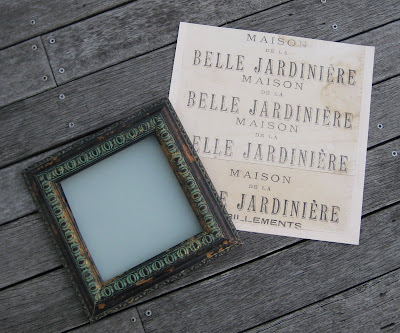 I've had this frame for many, many years and that sheet of scrapbook paper for a few years, lol! Put them all together and volia! How cute is that!! Even hubby thought it was cute! And here it is now in my bedroom. 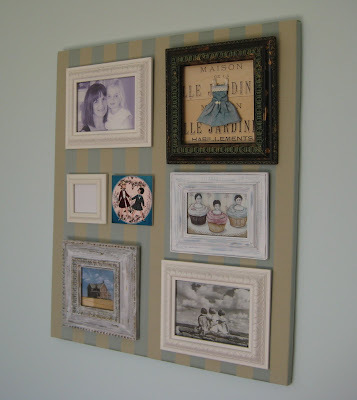 I have far too many picture frames and I don't like making too many holes in the walls so the other day I decided this might be a good idea. A sheet of soft board covered with fabric. And now I have a sort of picture mosaic and they can easily be changed around. 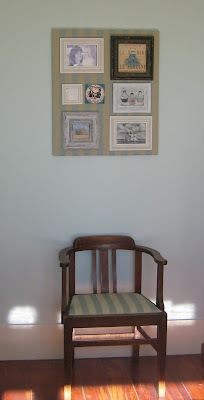 The little empty frame is waiting for me to find a baby picture of Noah, maybe I should do that right now. And that's another designer fabric sample covering the board and the chair. 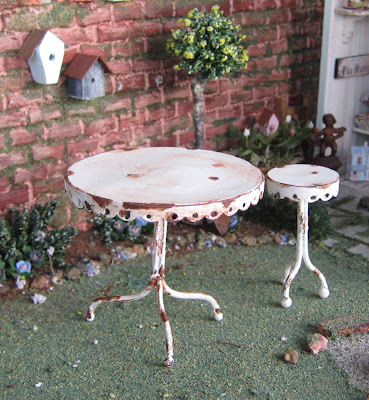 That was a great big sample piece just the perfect colour for my room, I love it when things just happen to work out! 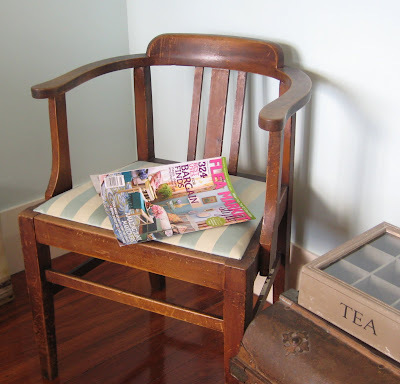 Fleamarket Style in my house! 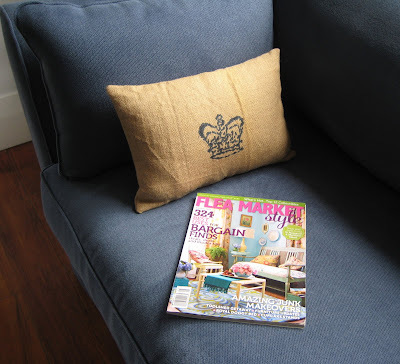 After I showed the mini version of the Flea Market Style magazine in a previous post I was emailed by several lovely people offering to send me the real magazine. And here it is in my 1:1 house for real!! Sent to me by the Flea Marketeers themselves - Linda MacDonald and Matthew Mead!!!! I still can't believe it's here, I never dreamed I would actually be able to read the real magazine. The magazine is a visual delight and truly inspirational. 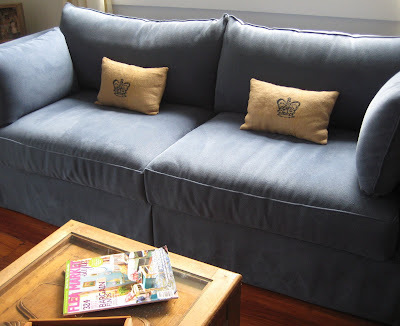 See that sack cloth cushion on our (brand new) 1:1 couch...well, I got that idea from the magazine. That sack cloth I've had tucked away for years. It's real designer sack cloth which sells for hundreds of dollars a metre here, it already had the crowns printed on it. But I found a very upmarket shop that sells off their discontinued fabric samples for a mere $5 each (that's even less in any other currency!). 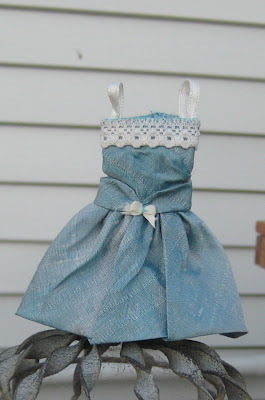 I'll have to show you another day what I've been able to do with other fabric samples. Thank you for the magazine and all the wonderful inspiration Linda and Matthew!! 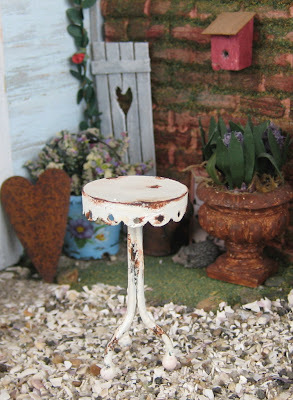 I've been having quite a lot of fun making these little tables. And a big brother to go with the rusty one. 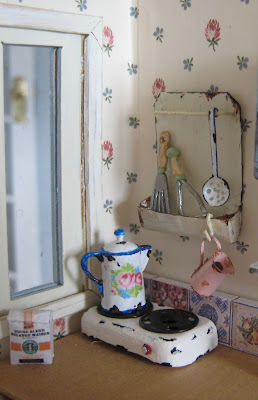 I think the slightly rusty one looks like it belongs here in the shabby house. 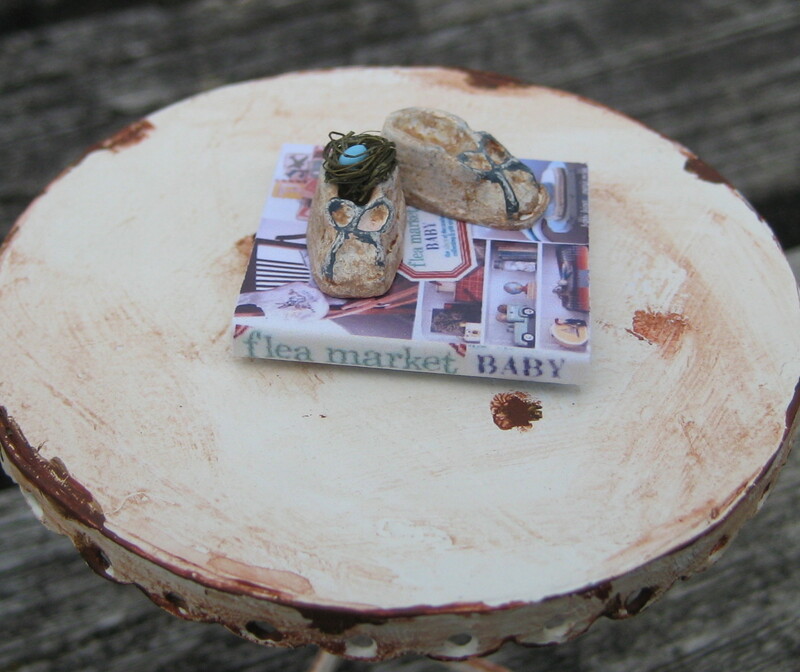 The little 'Statue of Liberty' came from a tiny snowglobe that belonged to Liberty. She was absolutely heartbroken when she dropped the globe and it smashed into a million pieces...I, however, was rather happy to see that tiny little statue. I've had a LOT of computer trouble in the past week which is why you haven't heard much from me. Of course having no computer has meant that I've had more time to make things...more to show you soon!